Traditional, Romantic, Cyber, Victorian, Medieval, Vampire, Geek, Gothabilly, Stempunk -- and a dozen more stereotypical variations explained at Blackwaterfall. 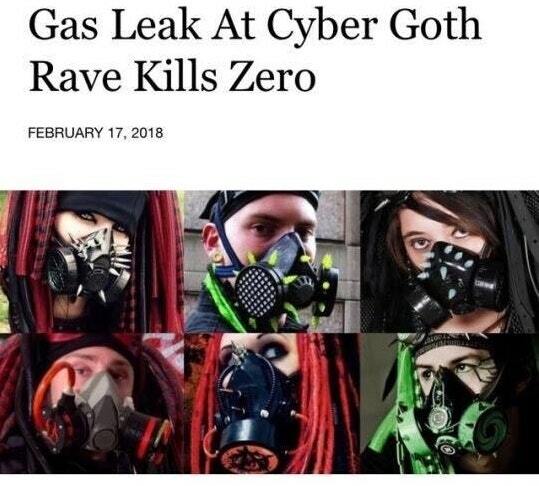 Their online presence is declining, too: the cybergoth subreddit has barely any updates and 'cybergoth confessions' Tumblr stopped posting two years ago. It's rare to see a flash of neon cyberlox or space goggles on the streets anymore... It's more likely that it's just operating in a different space. "The gas mask thing, people generally laugh at nowadays too. It was very 2004, but not in right now." Goggles, on the other hand, are just about acceptable. I went from 5 to 14 when I was young. Now, if I weren't supposed to work in an official place, I would propably be a 20. If you've ever been a goth, you're still young. I'm a cross between 3, 7, and 21. 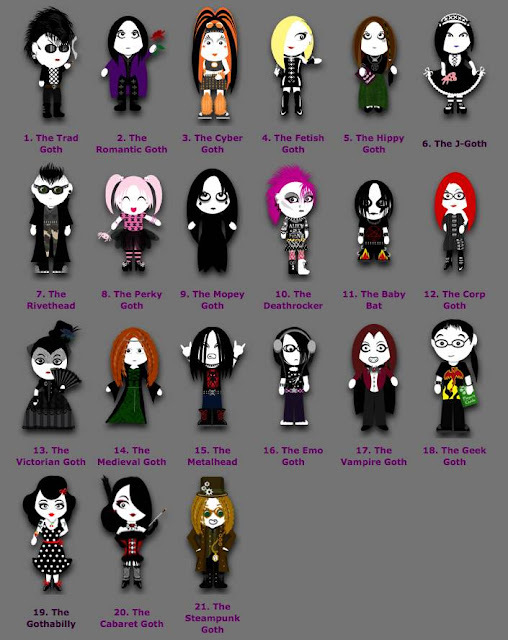 It's funny, "Gothic" is used as a blanket term understandably for a wide variety of sub genres as shown here. What ultimately began as a literary minded group of people who had an affinity for wearing black, lace, etc.. morphed into a fashion scene with many variations. Metalheads would argue they are not "goth",and Goths would argue "EMO" is misplaced, and so forth. Emo was never a part of the gothic world... And its NEVER going to happen. Because emo and goth are two different subcultures. If you can't understand the difference, go and do more reasearch. They both spawned from the punk scene, but at different times and the overall feel is different. If you think of it in evolutionary terms, they share a common ancestor, but have been collecting unique characteristics as they each evolved within their own lineages. If you want to go back to the older versions of each to see early differences, they're both tied to music but the style is different. Alkaline Trio was an early emo band and Siouxsie and the Banshees were an early goth band. The clothing and hair is also different, but would take quite a long time to describe, so I suggest googling pre-existing write-ups on it.